My grandparents traveled all around the world and during their holidays my grandmother collected postcards, photographs, and other various souvenirs illustrating the landmarks they visited. 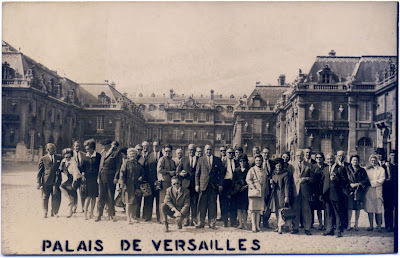 Here my grandparents can be seen with their tour group standing in front of the Palace of Versailles, Île-de-France. The woman wearing sunglasses and a scarf around her head standing behind and to the left of the man kneeling down is my grandmother Johnny and the man standing to the left of her is my grandfather Murray. I like examining photographs of large groups of people, especially when most all of them are total strangers to me and they are looking directly at the camera. I like to make up my own conclusions as to who they are and what types of lives they lead based on the expressions and their body language. I like this image because the group of people bleed right off the page, as if the photographer had no clue how to compose a photograph of a crowd. I also like its poor quality and sepiatone. Sepiatone images always look like they were taken from someone's imagination or dream.